On behalf of the Khmer-Krom families in Soc Trang Province, we would like to urgently appeal and notify you of the unfair trials of two Khmer-Krom monks and six followers who face 10 months to 6 years for exercising their freedom of speech, opinion and association. 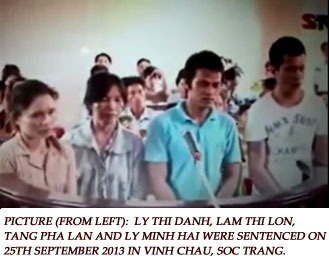 On the 25th of September, 2013 in Prey Chop Commune, Lai Hoa Village, Vinh Chau District, Soc Trang Province, four Khmer-Krom people were sentenced for up to a year for creating “Public Disorder”. Lam Thi Loan – Born 1957 – 1 year prison. Ly Thi Danh – Born 1970 – 1 year prison. Ly Minh Hai – Born 1978 – 11 months prison. The four were simply exercising their basic freedom of speech in rallying their support of Venerable Ly Chanh Da, who was defrocked twice and humiliated in front of television for wanting to create Khmer classes at his temple on May 16th, 2013. They were in turn, punished and imprisoned. Venerable Ly Chanh Da has since fled to Thailand to seek asylum. Kampuchea-Krom and escaping abroad to against Vietnam. Abbot Venerable Lieu Ny, born in 1986 was sentenced to 4 years prison for not following orders from the Patriotic United Buddhist Association to defrock Venerable Thach Thuol. In the video testimony entitled Khmer-Krom Practicing Theravada Buddhism in Fear, Venerable Lieu Ny refused to defrock Thach Thuol because he did not violate any Buddhist principles. Thach Phum Rich, born in 1989 and Tra Quanh Tha, born in 1978 were sentenced to 3 years and 2 years respectively for helping the two monks flee after they became fearful of their safety. We are deeply concerned about the transparency and unfair trials of these Khmer-Krom individuals. The charge of “Public Disorder” for the Khmer-Krom victims in Prey Chop, remains a powerful tool in which Vietnam authorities use for political prosecution and silencing of dissents. There were no legal representations for any of the Khmer-Krom victims and Venerable Thach Thuol faces six years in prison for admitting that he just did human rights work. Ask Vietnam to immediately release all victims unconditionally. Help investigate the situation by sending a representative to talk to all the prisoners. Urge Vietnam to let all Khmer-Krom victims have the right to appeal against the sentence and have a justice trial with legal representation. Help bring the issues of the human rights abuses of Khmer-Krom people as described above in your next meeting with Vietnam. Ask Vietnam to provide medical assistance to all Khmer-Krom victims, in particular Mrs. Lam Thi lon who has been reported sick and has received no medical aid or medicine. Remind Vietnam that it has violated the Universal Declaration of Human Rights Article 10, which states that, everyone is entitled in full equality to a fair and public hearing by an independent and impartial tribunal, in the determination of his rights and obligations and of any criminal charge against him. Remind Vietnam that it has violated Universal Declaration of Human Rights Article 14 which states that everyone has the right to seek and to enjoy in other countries asylum from persecution. Ask Vietnam to respect and allow all Khmer-Krom Buddhist monks and its followers to freely practice their religion without fear or control in respect to Article 18 which states that everyone has the right to freedom of thought, conscience and religion; this right includes freedom to change his religion or belief, and freedom, either alone or in community with others and in public or private, to manifest his religion or belief in teaching, practice, worship and observance.